At the end of the day scores of Marines lay dead. It was June 6th….just not the June 6th you were expecting. A couple of decades ago while on one of my frequent hitchhiking jaunts across the United States, I came into a small Dakota town, grabbed lunch at a typical mom and pop general store then sat down to eat in the shade of the town square. Next to me was a small monument dedicated to all the county dead from ‘The Great War’ as it was called at the time. Later to be known as the First World War (after we experienced a second round of even greater slaughter). What caught my eye was not the list of 25 or so names engraved on the front, it was that 1/2 were listed as dying in some strange place named Belleau Wood . Later I learned this was The Battle of Belleau Wood on June 6, 1918 where the US Marines suffered their deadliest day in their history…..1,087 dead. 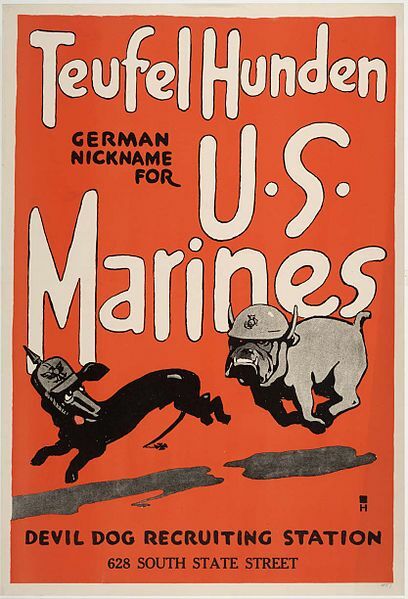 This was also the Germans first encounter with the US Marines, who fought with such ferocity that the Huns later called them “Tuefel Hunden”….Devil Dogs. The date June 6th will primarily be remembered for the action which took place 26 years later on the beaches of Normandy. Many others will reflect upon D-Day, so it’s only fitting to take a second to recall what the Devil Dogs did in the hills of France in 1918. Most of the dead rest in the nearby Ainse-Marne American Cemetery. Thanks for sharing Mike! I didn't know this! Amazing how much of history goes unrecognized. God bless them all! Beautifully written. Thank you for writing this.